Saturday morning hundreds of women and men met on Bloor Street to rally for various causes affecting women around the world. 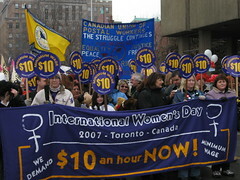 The official campaign issue of the march was the raising of Ontario’s minimum wage to $10 per hour. The current minimum wages in Ontario is $8 and the majority of workers covered by this minimum are women. Given the cost of living, many people have two jobs so as to make ends meet (I worked with someone in Calgary who had three). A bill is now before the Ontario Government and a number of organisiations have banded together to lobby the government to adopt the bill ( www.amillionreasons.ca ). In comparison, the minimum wage in Australia is $12.75 per hour and despite the Howard Government’s objections it has increased regularly over the last ten years. For increases to the minimum wage to take place under the new ‘WorkChoices’ legislation, a review is undertaken by the ‘Fairpay Commision’ at its leisure. This commission is appointed by the Government of the day and has the power to determine wages in whatever way it sees fit (see 2006 Australian Government Submission). Therefore wage increases are not debated and voted upon as they are in Ontario, and they are not determined by an independent arbitrator as they used to be prior to Workchoices. I only hope we prevent things going to far down the US track, where the mininimum wage is $5.15 per hour and has not increased in the last 8 years. [ DONT SEND THEM BACK ] Dell. Thanks for the international perspective, Gem. I noticed two things about International Woman’s Day in Australia. As a dedicated 702 radio listener I of course got a “balanced” perspective. Much of the discussion was about why modern young woman have disowned feminism. Another strand was about the impact of workplace legislation on family life and particularly on lower paid female workers, increasing time at work and lowering wages. The most important strand however was those who noted that in the Sydney Morning Herald that day, all letters to the editor (except the ‘First Word’) were written by women. Much was made of the fact that the offending first article was written by two men! It’s a good thing the the SMH editor has a sense of humour as well as a politically correct perspective.